Czech band DVA to bring us a great follow up to Machinarium, their critically acclaimed point-and-click robot adventure game. 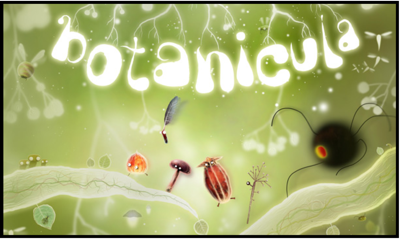 This new game is called Botanicula and features a huge cast of 'critters' all of which inhabit a tree. The tree is being attacked by black spider-like creatures (see above screen shot) and the story is the odyssey of a group of five of the tree's inhabitants, each with it's own special skill, and their attempt to thwart the evil doers. As is typical with Amanita Designs games, there is no dialogue. I find this ideal for youngsters as it gives them the chance to use their imagination to create the story dialogue from their perspective. With no dialogue driving the story, the five 'amigos' call out to be named and I've named each of the five as shown in this graphic. Kids will see these characters differently and name them accordingly. Not all of the critters that live in the tree are friendly to our five amigos. Some are just cranky and are relatively harmless but the spiders are to be avoided at all times. What I really enjoy most about the game is what I think my grandkids will also enjoy and that is the absence of 'adult' logic. We adults need to check our need for 'linear logic' at the opening screen and accept that the game is forcing us to think more like a child than like an adult. In other words, let go and 'go with flow'. The sound track is as free-wheeling as the game. Many different and unexpected sounds accompany the character animations and play in the background. Along every limb of the tree and in every dark corner there is an unanticipated surprise. But enough of this talk, look at the following video I made to introduce you to the game. I hope you enjoyed that short romp in search of a feather. If you would like to play the first level of the game in your browser or purchase the game, read on. and the Botanicula demo will load (sorry, no Ipads). You can download the full version from this site or you can visit http://amanita-design.net/ where you can purchase and download both Botanicula and Machinarium. 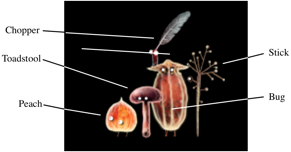 To view other grandadscience posts on Amanita Designs games, see the archive section on the left side of the grandadscience blog. We are officially "addicted" to this game. Asher and Kate both love to play. I have let them each have 15 minutes of play time by themselves. This also helps them learn how to use the mouse!